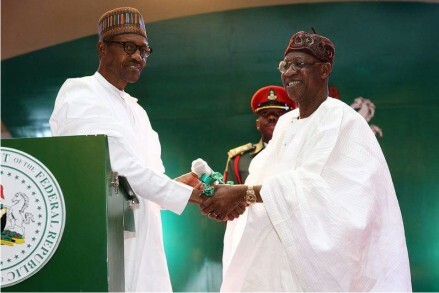 Minister of Information and Culture, Alhaji Lai Mohammed, has claimed that the current government led by President Muhammadu Buhari is working tirelessly redeem its electoral promises. According to him, contrary to what opposition and the enemies of the government are saying, Buhari has been living up to expectation especially in the critical areas of developing the economy as well as fighting corruption and insecurity. The Minister stated this in Abuja on Friday while signing a Memorandum of Understanding (MOU) with the visiting Chinese Vice Minister of The State Council Information Office, Mr. Guo Weimin, in the area of media and cultural relations. He said, “Contrary to the lies that are being purveyed daily in the Social Media, this government has been working assiduously to redeem its electoral pledges. Our fight against insecurity is yielding very positive results. “Our fight against corruption is focused and is ongoing and we are resolute and we have resolved that we are going to fight corruption until corruption goes under. We are happy that in this regards, we have a very good partner in China because we are aware and we know how China fought corruption and how China is fighting corruption. “We have succeeded in nursing a very sick economy and very soon, Nigeria will get out of recession,” he said. The minister expressed optimism that some provisions of the MOU that encourage the news agencies of Nigeria and China to reflect, in their reporting, the social, economic and cultural development in both countries, will eliminate the phenomenon of fake news. “This is significant because we are today in the era of fake news. Unlike China, the Social Media here is completely unrestrained. Therefore it is important that you get your news directly from the official source,” he said. The Minister sought the support of China towards the training of the Ministry’s Resident Information Officers on modern Governance Public Communication methods in order to build their capacity as the respective spokespersons of Ministries, Department and Agencies.